Fat Quarter Shop's Jolly Jabber: Meet Our Machines! 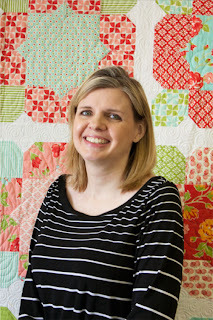 We are so excited to be a part of Sew at Home Mummy and The Tilted Quilt's Meet My Machine Blog Hop! As you know, we love to quilt around here. Our sewing machines are very special to us and we are happy to be introducing them to you all! 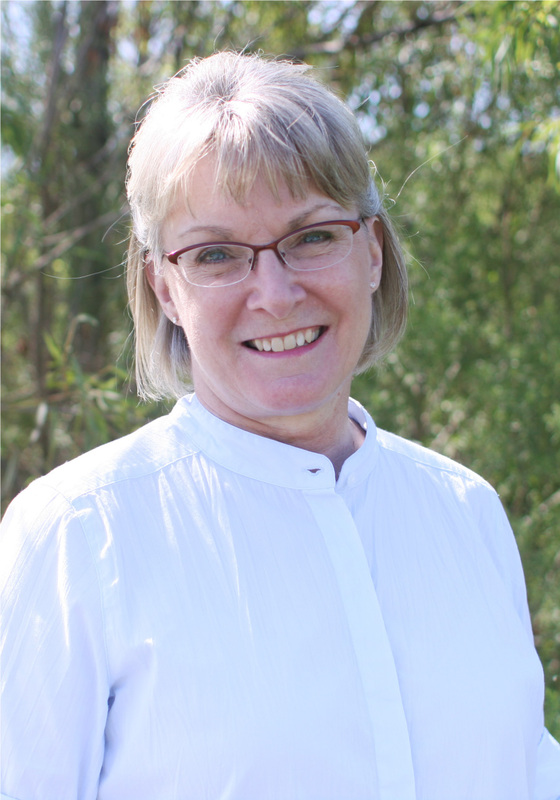 Kimberly, Debbie and Cheryl will take you through their sewing rooms and let you meet their machines! Hi, Kimberly here! I want to introduce you to my Babylock Crescendo. I had the Baby Lock Ellisimo and the Baby Lock Symphony and recently upgraded to the Babylock Crescendo. I love Baby Lock machines and I have a really bad habit of trading in for a new model every 1-2 years. I need to stay out of the sewing machine store! I like to keep my Crescendo as clean as can be. No stickers or decals. I don't even take it to retreats! My Juki TL-2010Q is my on-the-go machine that accompanies me to retreats and to classes. I also recently bought a Baby Lock Evolution Serger and I just can't wait to master it! I am currently taking classes and will be using it for the many pillowcases I make for my four kids! My favorite feature on my Crescendo is the laser light that eliminates the need to draw a line when making half square triangles or flying geese blocks. I also love the pivoting featuring on the Crescendo. This feature leaves the presser foot up and the sewing needle in the down position. My favorite machine accessory has to be my walking foot. I use it to attach bindings, which I typically do about once a week. I have three different walking feet and use all of them! My sewing room is very small and in a strange space, filled with corners. I do love that it is small so everything is very close together. I love the Koala Furniture but my room is too small to fit the items in my room! I purchased all of my sewing furniture, chair and machine from Sew Much More in Austin, Texas. Ron and Barbara are wonderful and if you ever need a sewing machine give them a call and let them know I sent you! I store all of fabric in white wire racks that I purchased from The Container Store 12 years ago! I store similar fabrics together. I do not like any type of clutter so I actually clear out my fabrics every year so I don’t have any fabrics around that I won’t ever use. 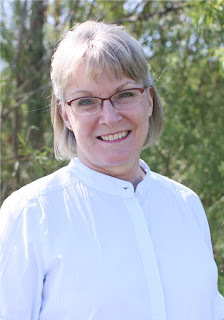 Hi, Cheryl here! 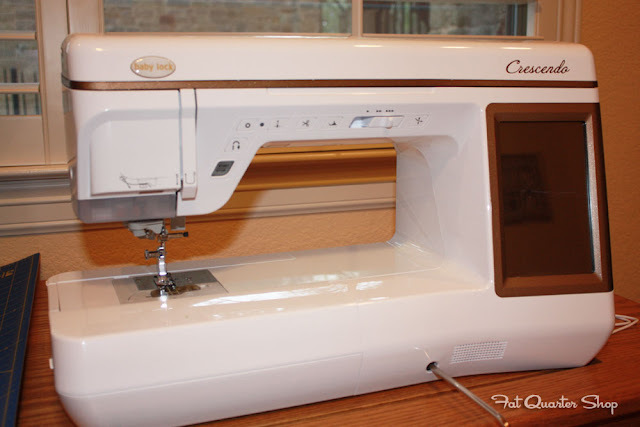 I would like to introduce you to my sewing machine, which I call Anne! It is not new, nor is it a really fancy machine, but it meets my needs very well! It is a Bernina Virtuosa 153, Alex Anderson Quilting Edition. I bought it about 8 years ago, when I began doing a lot of piecing. My favorite feature is now a common one, but I love the needle down option. My walking foot gets a work out, so it would have to be one of my favorite things. Also, I have a little foot that allows you to sew curved seams without a lot of pinning. If just feeds the fabric into a perfect curve like magic! I currently own four machines. The first is my Bernina Virtuosa. I have an antique Singer treadle machine, in perfect working condition. I don’t ever use it, but I love antiques and this is one of my most treasured pieces. I have a Bernina 807 from the early ‘70s that belonged to my mother-in-law. I have had it serviced, so it is ready for sewing. The third machine is a light weight Bernina Activa 125, I bought when I started taking quilting classes. I purchased this machine as a ‘starter’ one, and it served me well. My sewing room is a beloved space in my home. It is full of my mother’s quilts and many of her belongings. There is also an antique Victrola cabinet which houses my rulers and other notions. Fabric is stored in furniture chests. I have lots of family photos in the room, along with some framed needlework pieces I stitched for my mom. My cutting table which has two leaves and two drawers that are the entire depth of the table. The cabinet for housing my machine has a drop leaf on the back that can be raised whenever I’m working on a large quilt.I’m rarely alone in my sewing room – the family cat, Leviticus, is usually in the floor underneath the ironing board. 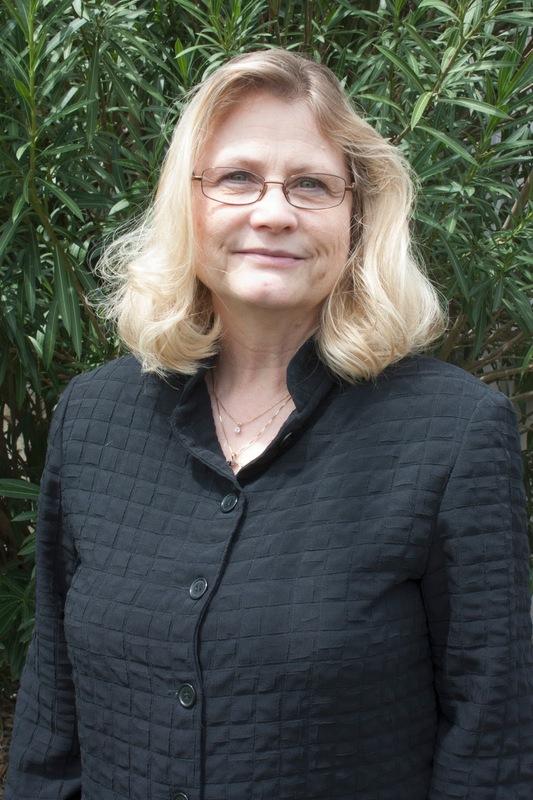 Hi, Debbie here! 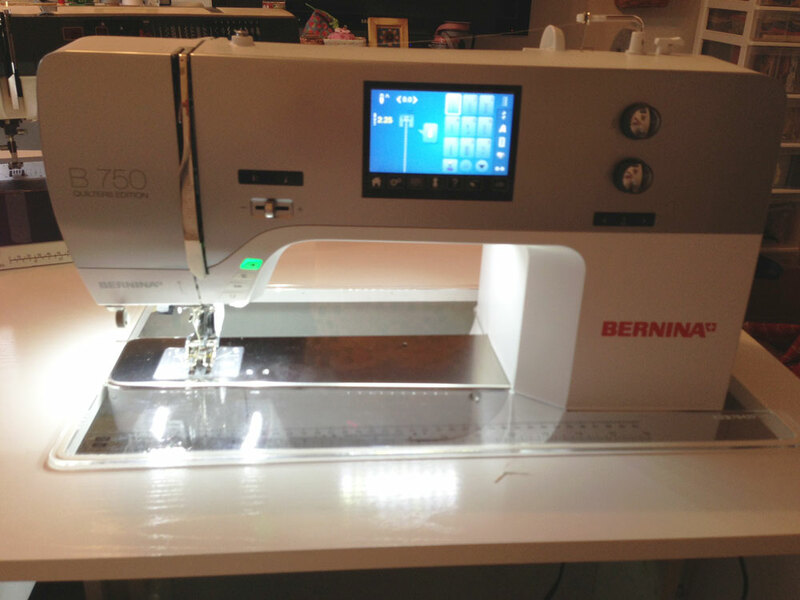 I currently own three sewing machines, but my most recent is the Bernina 750 QE! 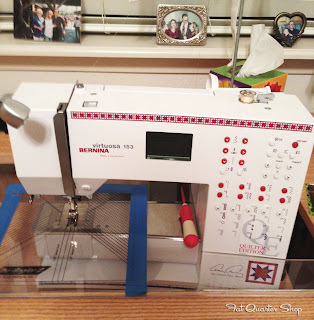 I call it my “Big Bad Bernina”! (“bad” meaning “awesome”) My girlfriend named it for me! Thanks Mette! My favorite accessory for my machine is the walking foot. And my favorite features are the automatic thread cutter, ability to save favorite stitches and settings into “favorites” and the huge bobbin. Also, I could not live without the “blanket stitch” feature! As for my other machines, my husband bought me a Viking Sewing Machine about 25 years ago and I started my “quilting” career with it. 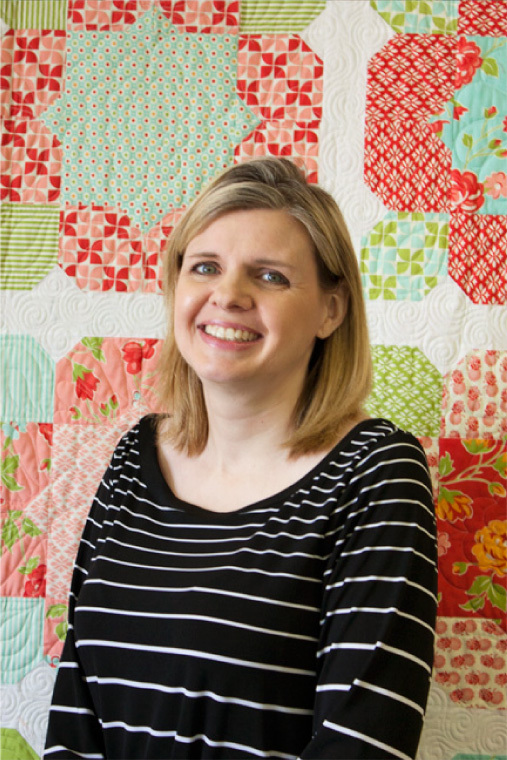 I took many quilting classes and made my first quilt with it. I keep it maintained and still use it once in a while. My second machine is the Bernina 153 QE and was purchased at Fall International Quilt Festival as a classroom machine. This machine took me to a new level of piecing and quilting and I still use it a lot! I would also love to own a Singer Featherweight, but just haven’t found the “one”! My sewing room is very small, but it works great for me! I purchased a Koala Sewing Cabinet at International Quilt Festival several years ago and I love it. Koala had a deal that if you bought one unit you got another of the same unit “free”, so my girlfriends and I collaborated and purchased our furniture that way. My cutting table is from a catalog and opens up to be huge. Then there is my big screen TV! I wanted was a flat-screen TV with a DVD player to watch movies, but my husband interpreted this as a 60” with NO DVD player! So I sit directly across from it and feel like the characters on the screen are right in the room with me! My stash is stored in two closets, one in the sewing room and then I took over my daughter’s closet when she went to college. I store everything in Container Store “sweater” boxes and try and keep like fabrics together either by collection or color.